Media room, study space, etc. A truly luxurious property just minutes away from Kamala beach in Phuket, Villa Lomchoy is a peaceful haven with everything you need to make your tropical dream come true. A gorgeous 14-metre infinity pool overlooking the cotton candy skies and unending ocean stands majestically flanked by a pool deck. Outdoor sala and open-plan living spaces allow you to take in fresh air no matter where you are. The villa has four bedrooms, each opening out to a terrace with splendid views. The panorama is ever present in front of you, all you need is to take time to breathe, relax, and appreciate the warmth of nature in this slice of paradise! Four exceptional bedrooms are offered by Villa Lomchoy, each a temple of luxury, comfort, and panoramic vistas of the ocean. Two are furnished with king-sized beds, one with queen-sized, and the last with single beds. 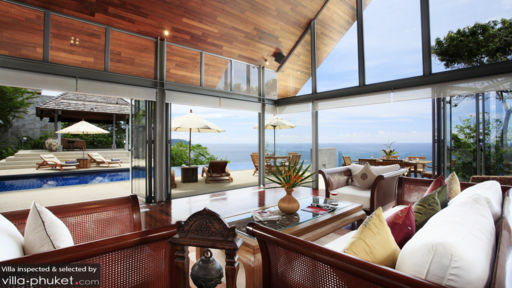 Sliding glass doors lead to a terrace that overlooks the scenic beauty of Kamala beach. Wooden flooring, artwork that is vibrant, and steps that lead to the gardens outdoors are what make the bedrooms perfect! There are en-suite bathrooms with each bedroom equipped with necessary amenities. Blue skies, blue ocean, and the blue infinity swimming pool of Villa Lomchoy all seem as one, each seamlessly blending into the other. There are neighbouring islands and boulders that can be spotted right from the sundeck which is decked out with sun chairs, parasols, for your comfort. An outdoor Thai sala is furnished with a comfortable daybed and overlooks the horizon, an undeterred view of the stunning skies with its many vivid colours. Alfresco dining is made possible on the deck, so you can dine in style and elegance under the starry-night sky! All around the villa, you will find that the entire façade points towards the ocean, and for you to get the best bang out of your buck, each room opens out to meet this view. The main living room is no exception as it leads to the pool deck directly via glass doors. With primarily wooden interiors, you have specks of colour in the form of silk cushions, plants, and décor. The high-peaked Thai ceiling is a striking feature of the living room making it all the more spacious and open plan. The comfortable seating provides a nice space to put your legs up and relax with a good book or to talk amongst family and friends. Beside the alfresco option, there is another dining area found indoors so you can take your pick and alternate between days! The kitchen is quite modern with state of the art facilities ready for use. The villa also hosts an elegant study space, which too opens out to the pool deck, and is equipped with shelves, a writing desk with office chair, and comfortable seating. A media room with comfortable sofas and TV is also available to guests. 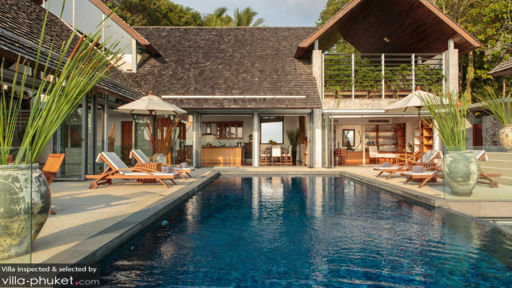 Villa Lomchoy is staffed with two live-in members to cater to your daily needs and they even extend concierge services if you need any help with tours etc. Massages in-house are available at an extra cost, and so are the services of a personal chef! 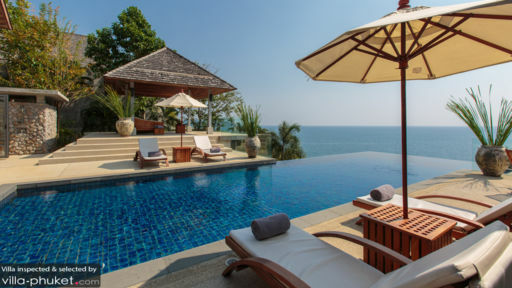 The villa is 10-minutes away from Kamala beach and is located in a serene spot which doesn’t see a lot of crowd. There are restaurants and beach clubs like Old Siam, Iguana, and Pan Yeah not far from the villa that can explore!